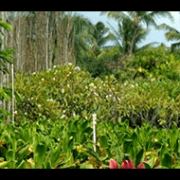 In September we raise awareness to the Leeward Haleakala Watershed Restoration Partnership. 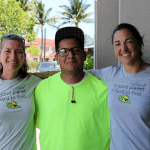 The vision of the program is to work together to restore the native forests of leeward Haleakala to benefit our biological, cultural, economic and water resources. Haleakala is a volcanic mountain that makes up most of the island of Maui, you can visit Haleakala National Park and experience many great aspects of this beautiful mountain. Watersheds provide an integral link between the natural world and the burgeoning needs of increasing human populations. This constant and growing need for water, both agricultural and potable, is met by properly functioning mountain watersheds. 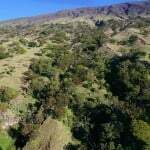 Reestablishment of koa forest on the degraded and/or denuded landscapes of leeward Haleakal? will restore the severely depleted regional aquifer. Forest restoration will increase fog interception and hydraulic lift (transfer of deep soil water to near surface soil regions via tall (>10m) tree root systems), which will enhance nutrient cycling, moderate water runoff, and increase soil moisture, leaf litter, and soil nitrogen. The changes in vegetation structure should increase not only water quantity but also substantially benefit water quality. Restoration of forest cover will also increase the number of days per year when water is available in springs and intermittent streams, increasing opportunity for water storage in tanks for agriculture and wildfire control. Decreased erosion will protect topsoil and allow for the retention of organic material, therefore building soil fertility and nitrogen, and forwarding the revegetation of upland areas. Without such management, ungulate feces, erosion and sedimentation degrade the quality of near-shore marine waters on which the community depends. In her now famous book The Polynesian Family System in Ka‘u, Hawai‘i, noted Hawaiian scholar Mary Kawena Pukui illustrated the original Hawaiian concept of forest types that scalloped the mountain slope from the coast, where most people had their habitations, to the high mountain summit above tree line. As we do, early Polynesian settlers utilized mountain areas as a source for their water, both for human use and agriculture. They harvested mountain plants and animals for food; utilitarian items such as cordage and barkcloth for ornamental, medicinal and ceremonial uses; and spiritual items such as bird feathers for featherwork which is among the finest ever produced. Mountains were also the source of valuable hardwoods, such as koa. Koa trees are a Hawaiian endemic species without near relatives in the central and eastern Pacific. Amazingly, the nearest relatives of koa occur in Australia and the Mascarene Islands (A. heterophylla) in the Indian Ocean. 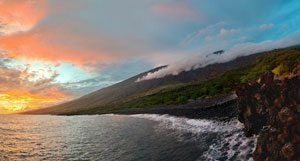 To settling Hawaiians, the high islands of the Hawaiian archipelago must have appeared as the ultimate gift from their ‘akua (Gods). Of all the gifts that awaited them, fresh water, large flightless birds for immediate food, brightly colored red, yellow, and green birds, and thick, verdant forests with massive koa trees up to 35 m (115 feet) tall were among the most significant. From these koa, Hawaiians continued the ocean navigating tradition of their ancestors, hewing massive wa‘a (canoe) from koa logs dragged off high mountain slopes. Once largely abandoned, the sport of outrigger canoe racing has resurged and occupies an important and characteristic part of Hawaiian culture now practiced throughout the world. 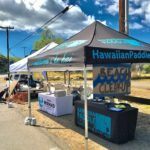 Though modern canoes are predominantly made of fiberglass, fittingly, the State Championship rules of the Hawaiian Canoe Racing Association (HCRA) dictate that all participating canoes must be constructed of koa.